(Nanowerk News) TurbuGrid is the name of a small plastic grid approximately 16 x 16 cm that can markedly increase the efficiency of an air-cooled fuel cell stack. Tests by AAU researchers show an increase in efficiency of at least 33.5 percent, but this may be even greater if the grid is added to entirely new fuel cell stacks. The increase is due to the fact that the grid adds turbulence to the air flowing into the channels in the stack. Turbulence has a major effect on the heat transfer that occurs in fuel cells, and this has important implications for how high a power density can be achieved from the fuel cells. "We would like to have the fuel cell operating at around 5060 degrees because the reaction between oxygen and hydrogen has the best conditions at that temperature. So we need an effective method of transferring the waste heat that occurs inside the fuel cell so that the cell does not overheat," says Torsten Berning, Associate Professor in the Department of Energy Technology at Aalborg University. 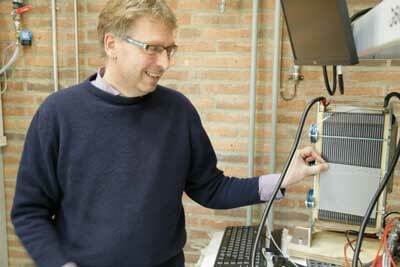 "Previously, researchers and industry aimed to create an airflow that was as laminar as possible. But our research shows that it is much more about ensuring effective heat transfer, and this can be achieved by adding turbulence," says Berning. "If we are not good at controlling heat transfer, the stack will quickly get too hot, and we cannot extract as much power as there actually is potential for. But by adding turbulence we see significant results in terms of ensuring efficient heat transfer to the air – and thus also a marked increase in fuel cell efficiency," says Berning. The air-cooled fuel cells are currently being used in material handling with forklifts, as emergency power plants for IT and the telecom industry and for smaller drones. Fuel cells typically last 5-6 years, depending on how they have been operated, but by adding the grid to a fuel cell stack it will it be possible to extend service life because the temperature in cells is controlled in a more appropriate manner. An air-cooled fuel cell stack costs at least $1000/kW, so in addition to using the grid on the new fuel cell stacks, it can also be a good business to add it to the fuel cell stacks already in operation.